금동 자물쇠 일괄(金銅鎖金一括)유물은 통일신라시대의 금동 빗장 1점, 금동 문고리 1점, 금동 못 2점으로 구성된 출토품이다. 빗장의 길이는 26cm, 문고리 길이 10.5㎝, 못 길이 4.9㎝의 크기이다. 금동 빗장은 보존 상태가 양호하고 도금도 잘 남아있는데, 이처럼 금동 빗장과 문고리 등이 함께 출토된 예는 극히 드문 편으로, 탑과 부도에 새겨진 문짝 장식에서만 볼 수 있었던 통일신라시대의 문짝 형식을 새롭게 밝혀준 귀중한 자료이다. 빗장은 왼쪽 부분에서 분리 접합할 수 있도록 만들었고, 열쇠구멍도 왼쪽 옆에 뚫려 있다. 문고리는 둥글고 고리판 역시 둥글게 만들어져 있다. 못은 고리로 된 머리 부분과 짧은 목 아래로 박히는 뾰족한 부분으로 구성되어 있다. 문고리 전면에 장식된 무늬는 매우 유려하고 섬세하여 뛰어난 통일신라의 공예 기술을 보여 주고 있다. 빗장의 형태가 옆으로 길며, 장식이 단순하고 끝이 살짝 반전된 비녀 모양 장식 등으로 미루어 볼 때 통일신라 중기경에 제작된 것이라고 여겨진다. 통일신라시대 금동 빗장의 실물자료로는 유일한 것으로서 전각등에 사용되었던 것으로 짐작된다. 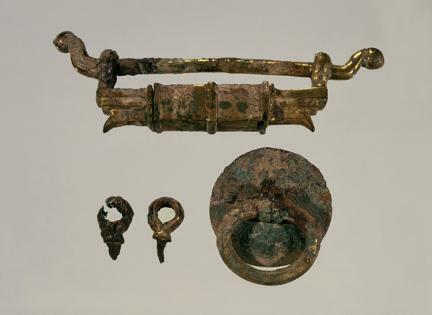 A total of four items, a crossbar, a door handle and two nails, dating from the Unified Silla period were found in the same place. The gilt bronze crossbar is 26 cm long while the door handle is 10.5 cm long, and the nails are 4.9 cm long. The crossbar has been preserved in a decent condition, with the plating intact. It is rather unusual to have both crossbar and door handle excavated together. They are important materials that will disclose the secret of the doors used during the Unified Silla Period, whose exact shape could until now only be guessed from designs left on pagodas and in paintings from the period. This crossbar can be separated or attached on the left side where the keyhole is also located. Both door handle and handle plates are made in a circular shape. The nails consist of three parts, a looped head, a short neck and a pointed end. The elegant and evocative ornaments on the front side of door handle reflect superior craftsmanship. The crossbar is long and has simple ornamentation. An ornament resembling a hairpin slightly reversed at the end indicates that it was produced sometime in the mid Unified Silla period. 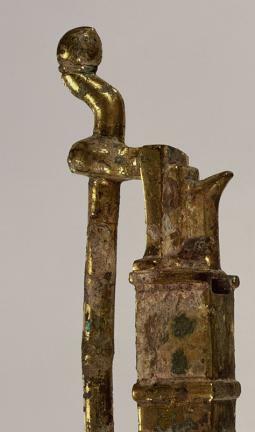 This is the only gold-plated crossbar from the era of Unified Silla. Although its exact mode of use is not known, it would certainly have been used in the royal palace.